Posted by Phil Jeudy in IT. I bought this book in 1983. This book was fascinating. It was explaining a coming revolution combining information and quickness. 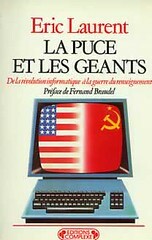 The first chapter is about Silicon Valley, the others about IBM, Japan, Russia. The book is about the end of (sort of) an industrial era. The summary on the back is mentioning the term “a new economy” still so used now and that means so much waste. I wrote many things on the book when writer mentioned Frederick Terman. Terman is considered as the man who has thought the concept of Silicon Valley…and create it with many others… He introduced Dave Packard to Bill Hewlett, creating their new venture in 1939 with 480$. He described a capitalist person as a someone crossing situations, and someone who has the choice. “You have the choice, never have any doubt”. Now I have something to work on. 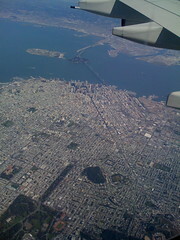 For my 3rd trip to San Francisco in less than 6 months. Do I had any choice up to now? Not sure. Never having any doubt: that’s a standard for me. But this does not makes me a capitalist. For sure! Posted by Phil Jeudy in Business, Friends, Fun, IT, More about me, My business, News!, Philosphere, Uncategorized, Voyages, Web, Wireless. I strongly advice people interested to export their talent is the US to follow their story… they made it both, made their dream come true…and the story is just starting!!! I will watch this topic on Google with the few stuffs we made… to be clear not to spread an ego-marketing buzz, we are just humble but so happy!!! – Olivier Ezratty CES 2008 report: Olivier’s papers are always very interesting, he knows how to pick up things and explain them. And he’s not afraid to build a report of 175 pages! – Franck Lassagne: a geek view on CES…interesting too! Posted by Phil Jeudy in IT, Web. Vote for LinkedIn in Time.com’s 50 Best Websites! This is woh I learned there was another competition… This is the “Time.com’s roundup of the most interesting sites of the year”. Twitter, Joost, Tumblr, Netvibes, LastFM…and many others…Go for voting you too! Very interesting also on Time: the 25 websites you can’t live without! Just check with your own list to ensure you’re uptodate! I could use so many space on this blog to mention everything I saw there…really interesting…see my photographs on my FlickR…I will return anway, and best thing to do if you’re in Paris is to go to visit! To last until October 2nd 2007. Web site here in French. 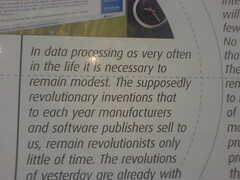 The thing I really loved to is the conclusion: “in data processing as very in th elife it’s necessary to remian modest. Really not the feeling I have when I see things occuring now with Web 2.0, media fascination (some of them but mostly in fact), and serial entrepreneurs…some of them are good and in adequation with this concept…but not all of them! And I strongly believe it”s key, whatever the ego you need to create some business in France for example!! !